Giving back to the community is something I try to do regularly but I don’t always get the kids involved. This time, I’m teaming up with Champions for Kids to bring you this post to show how easy it is to give back with your kids. I participated in this program on behalf of Champions for Kids and The Motherhood. All opinions are my own. It is important to give back whenever you can, but it’s even better when you can see the results close to home. Champions for Kids is making it super simple to give to the children in your community the resources they need to thrive. SIMPLE Giving is a Champions for Kids program that makes it simple for you to help local children get a healthy breakfast and stay focused in school. 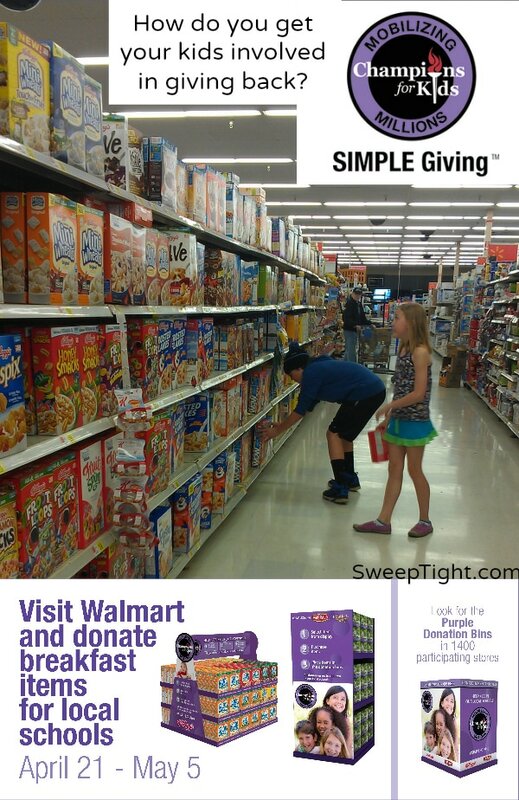 To participate, just purchase breakfast items at your participating Walmart and place the items in the big purple bins. Did you know that 9.8 million kids get free or reduced price school breakfast on an average day, but 10.6 million eligible kids go without? As a full time student studying nutrition science and mother of two growing kids, I can personally attest to the fact that a balanced breakfast increases academic performance. Chances are, you will already be shopping for something at Walmart. So, why not grab an extra box or two of cereal and tell your kids to add them to the big purple bin? My kids were super excited to pick out their favorite cereals to donate. All donations will go to children in schools near each participating Walmart store. The school district that collects the most donated items from a single Walmart store in its division will also receive $10,000 from Champions for Kids. And the school district that collects the most donations from a Walmart store in its region will receive $1,000 from Champions for Kids! For a full list of participating stores, school districts, Walmart Divisions/Regions and official rules click here. What: The Motherhood is joining Champions for Kids along with Kellogg Company and Diamond Foods for this Twitter party to spread the word about a simple way we can help ensure that kids in our communities enjoy a nutritious breakfast that will help them stay focused in school! I am lucky that my kids naturally have giving hearts and do this when we are shopping. We try to keep it to just a few local organizations for I feel we need to start local to help make a difference in the world. I love when companies give back! Such a good cause. This is awesome!! I love this initiative, I’ll try and make it to the party!! We always try to give back. When the kids were younger they helped when I volunteered at the food shelf. I love these simple service projects, and they are great to do as a family. We always try to give back when we can. We foster animals, volunteer, and donate to all our local food banks. I think it is great when companies give back, it makes me more likely to buy from them. What a great program! In our family my husband and I are pretty active community members and on several boards for charity/community organizations. Our boys generally are in attendance at meetings so they are learning from a young age what it means to give back and all the areas they can do their part in. I love things like this that make it easy for my kids to help give back. We are a service orientated family! This is so important to teach children! With how cheap cereal can be with coupons this wont be an issue for me! i love Champions for Kids, I have participated in their campaigns in the past, i love how they give back! I LOVE champions for kids! I love being able to help local organizations through their programs. That is great! I will donate cereal next time I’m in Walmart. Our local schools have a summer breakfast program too, which I think is great because kids can go to school and eat breakfast even over summer vacation. Breakfast is so important for growing minds (all minds really). I love this initiative. How great that Champions for Kids is finding ways to help those in need in the community. Hope your twitter party had a great turnout. We do can drives, cereal drives and donate lots. I can’t wait until they are older and can enroll in more programs. We have always donate o local food banks. It’s so important to support our community. Great post!